The university has seen growing budget deficits in recent years due to both internal and external factors, according to an analysis by the President’s Cabinet, an advisory group comprised of seven HSU administrators including Rossbacher herself. One key factor is declining enrollment. The university is expecting 300 fewer students to enroll this coming fall than in fall 2017. That would represent a drop of roughly 800 students from HSU’s peak enrollment in fall 2015. “This enrollment decline is projected to contribute $1.8 million to the 2018-19 budget deficit,” the President’s Cabinet noted. Making matters worse, more students are leaving HSU during or after their first year. This past fall, only 68.3 percent of freshmen returned for their sophomore year. That’s down from a 70.2 percent retention rate in fall 2016 and 74.5 percent in fall 2015. There have also been “unfunded increases in salaries, benefits, and other mandatory costs” at the university, and the state budget will likely require even further belt-tightening. According to the President’s Cabinet, Governor Jerry Brown’s recommended 2018-19 budget for the California State University system was $10 million less than he’d previously indicated and $191 million less than requested by the CSU Board of Trustees. Students, faculty and staff have already been criticizing university administrators for perceived budget mismanagement and excessive administrator salaries, and today’s announcements are likely to spark more frustration, given the coming elimination of jobs and popular programs. The Third Street Gallery (formerly the First Street Gallery) is now in its 20th year offering art exhibitions in Old Town Eureka. The Children’s Center, meanwhile, offers low-cost child care and early education programs for families of students, staff and faculty. The university also plans to eliminate a number of vacant staff positions across several departments, reduce temporary faculty appointments this coming fall, cancel searches for tenure-line faculty in fall 2019 and cut five administrator positions, eight vacant staff positions and 30 other positions (both staff and administrators) from the Academic Support department in the coming months. Furthermore, the university plans to “sell, restructure, and/or pay off existing leases” on various as-yet-unidentified university properties, and HSU will hold off (for the next year and a half) on searching for a new chief information officer, vice provost and enrollment management associate vice president. Oh, and no more Enterprise Rental Car services on campus. For more info on the planned cuts you can read the summary prepared by the President’s Cabinet. Below is a message from Rossbacher that was shared today with the campus community. CORRECTION: We originally wrote that the administration is planning to close the Children’s Center. That’s not quite true — the report says that the administration will “seek alternate pathways” for it. Those pathways could include different funding sources, partnerships or privatization, according to the memo released today. After extensive review of the challenges facing us and following consultation across campus, the President’s Cabinet has reached a number of decisions regarding budget reductions. We all take these decisions very seriously; they will have a profound impact on many members of the HSU community. The Cabinet’s plan to reduce the budget by $9 million will have effects across campus, but the University will be in a much more secure financial position as a result and therefore better able to serve our students. The attached plan is not an “across the board cut”, but rather it outlines a process that will make strategic reductions in the functional areas of the campus. Impacted areas will continue to be engaged where reduction details still need further refinement. I want to thank the URPC [University Resources & Planning Committee] for helping to engage the University community in the budget discussion. I welcome feedback and additional perspective, including how we can best continue to engage in these discussions and your advice about implementation of the actions identified here. Please provide additional comments by Friday, March 16, so that we can stay on track to meet our goal of providing the campus with the 2018-19 budget by March 29. 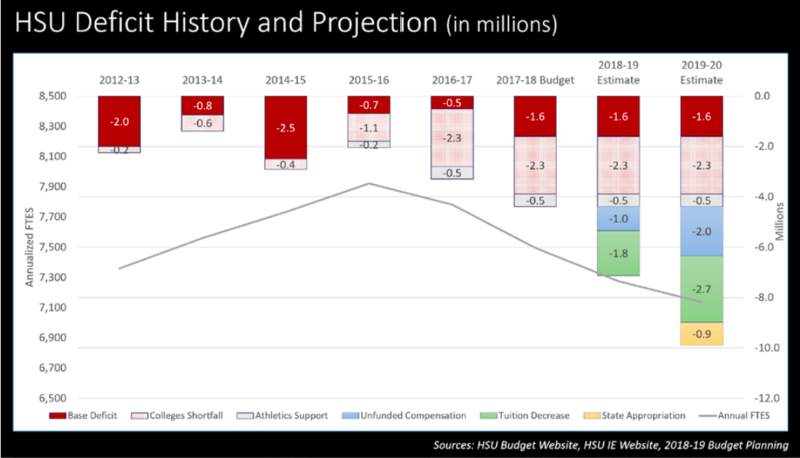 Taken as whole, the reductions will help HSU address the projected $7 million deficit we face in 2018-19, which would have grown to a projected $9 million the following year if we were not taking action now. The Cabinet members are aware how difficult these changes will be for many areas of campus, but we have concluded that these decisions are imperative. We are proactively addressing the larger deficit now to alleviate the looming fiscal emergency. The budget decisions outlined by the Cabinet demonstrate a serious effort to better manage our budget while minimizing the impact on our students’ educational experience. Throughout the process of making these decisions, students have remained our central focus. Our priority is making sure we do everything possible to help them be successful. They deserve our very best efforts, which means we must establish responsible, sustainable budgets that allow us to invest in the changing needs of our students. As a University, we remain committed to investing in our highest priorities. Balancing budgets is not enough. For HSU to thrive into the future, we must continue to build upon our strengths and our values around student success, social justice, and environmental responsibility. In recent years, this focus has led to adding new tenure-track faculty, efforts related to equity and diversity, expansion of student support services, creation of place-based learning communities, and a new Center for Teaching and Learning. HSU’s success is built on everyone’s efforts. Our current situation does not change that - in fact it enhances the need for our collective continued good work. The Cabinet’s budget reduction decisions are outlined in this document (pdf). More information and resources are available on the HSU Budget Office website.